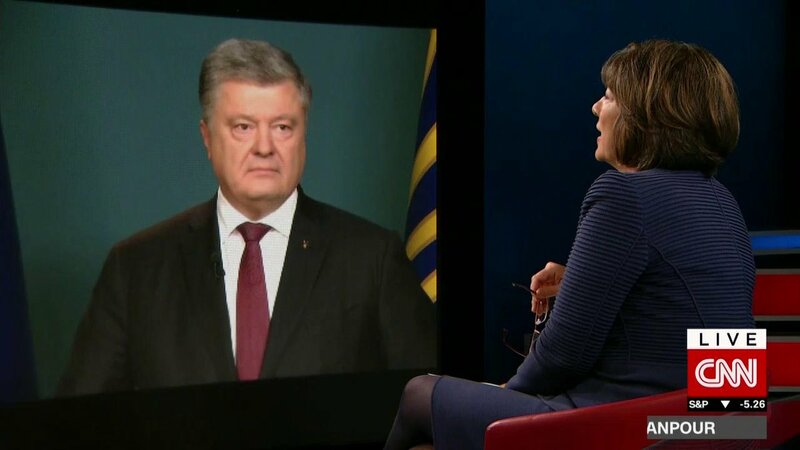 Ukraine's President Poroshenko just told @RichardEngel he wants President Trump to tell President Putin at G20 one simple thing: get out of Ukraine. 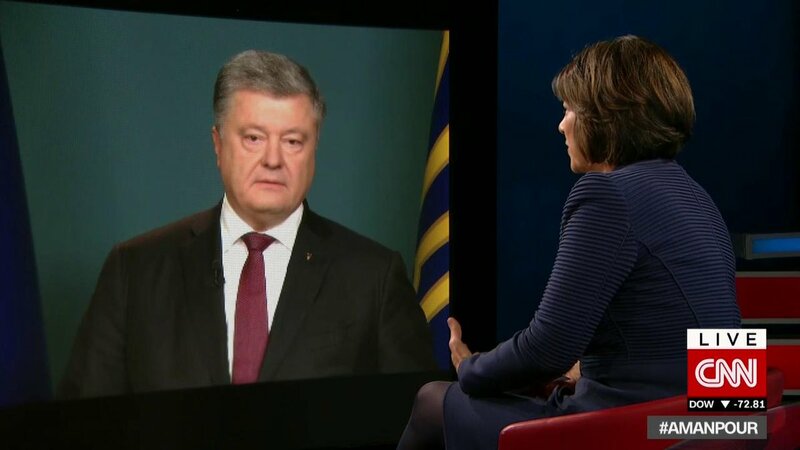 Ukraine's President @poroshenko tells @camanpour that "based on intelligence information, including those we received from our NATO sources," Russia is concentrating large numbers of troops along the Ukrainian border. "We have all the evidence of that". Asked if Pres Trump will condemn incidents of Russian aggression against Ukraine, Bolton says @nikkihaley spoke for the US yesterday at the UN "and we'll stand on that statement." NSA John Bolton tells @jonkarl upcoming Trump-Putin meeting "will be a full agenda. I think it will be a continuation of their discussion in Helsinki." 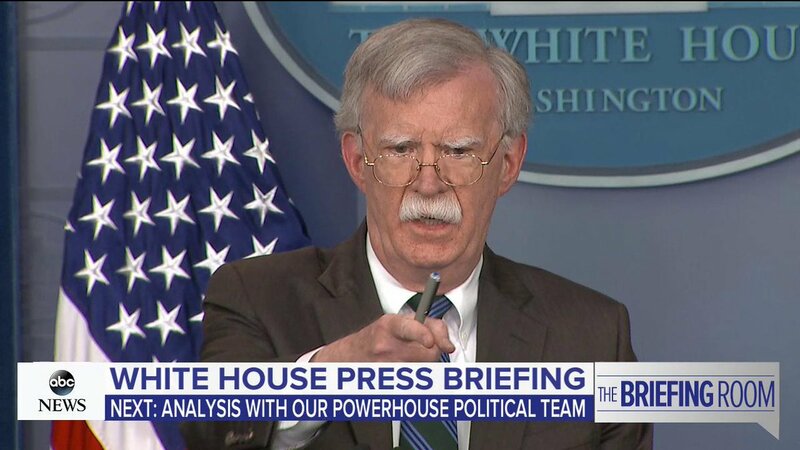 Asked if recent tensions in Ukraine will be included in the agenda, Bolton says, "Sure." 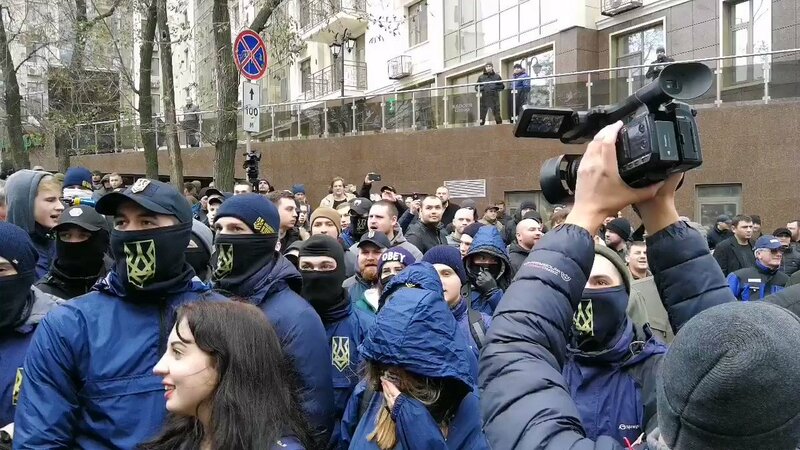 Ukraine is considering limiting the ability of Russians to enter Ukraine during the period of martial law, President @poroshenko tells. He says that a final decision will likely be made tomorrow. 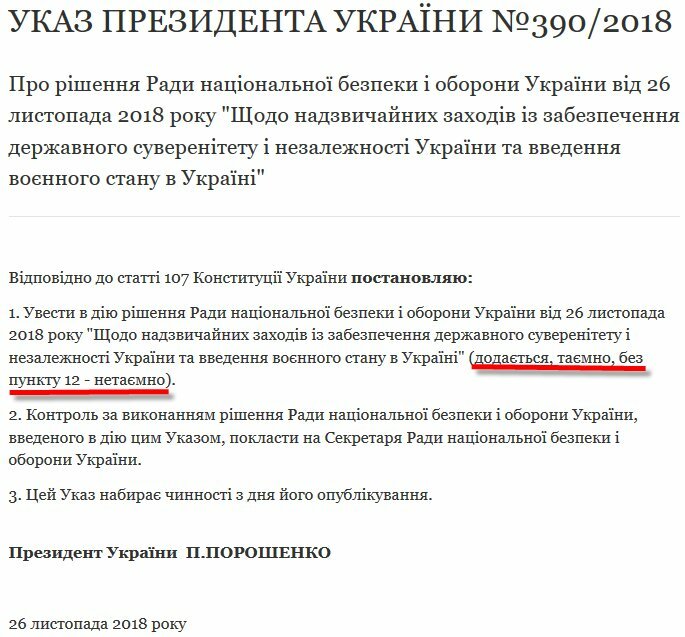 New statement by all 29 @NATO Allies: "There is no justification for Russia's use of military force against Ukrainian ships and naval personnel. We call on Russia to release the sailors and ships it seized, without delay. NATO stands with Ukraine". 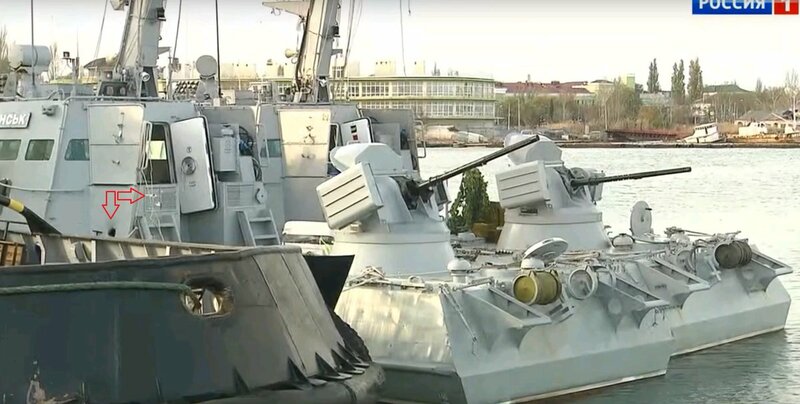 Russian President Putin is warning Ukraine against committing any “reckless acts” as Ukraine imposed martial law after Russian forces seized three Ukrainian ships and their crews in the Black Sea. 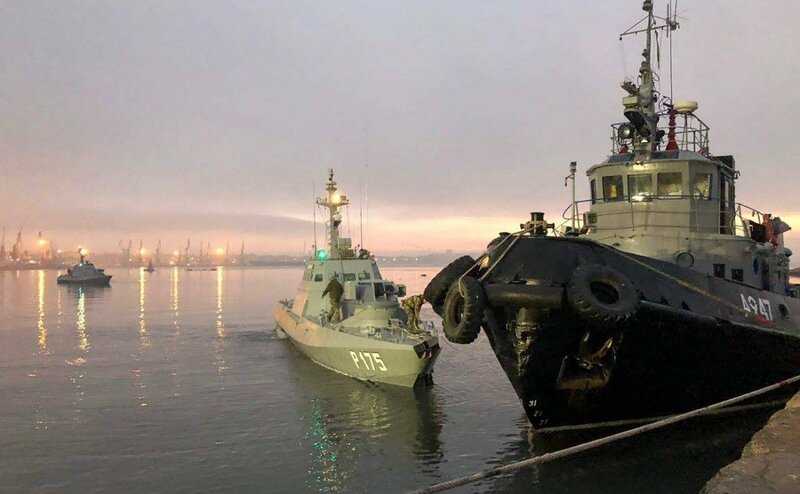 In an joint press conference the Polish and Bulgarian president called for immediate release of the Ukrainian vessels seized by Russia. 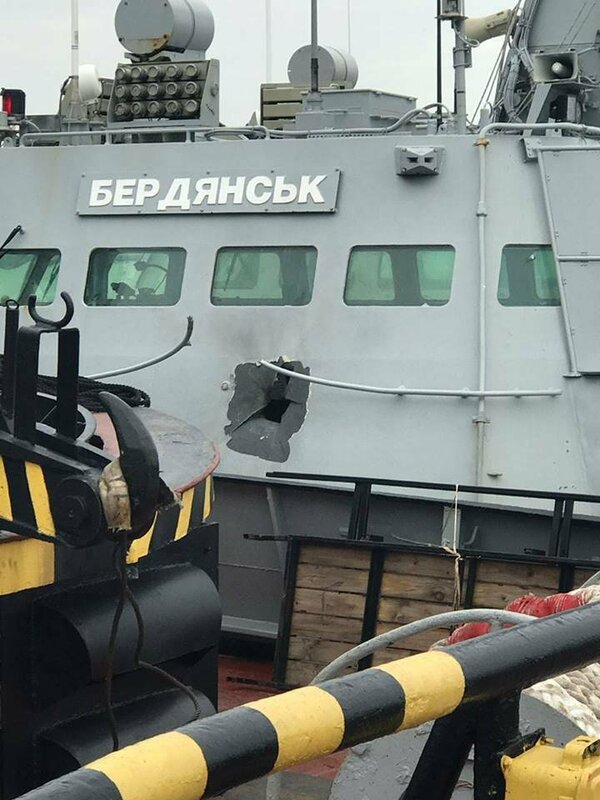 Kerch: Pic of the damaged Ukrainian boat "Berdyansk" held in Kerch port. 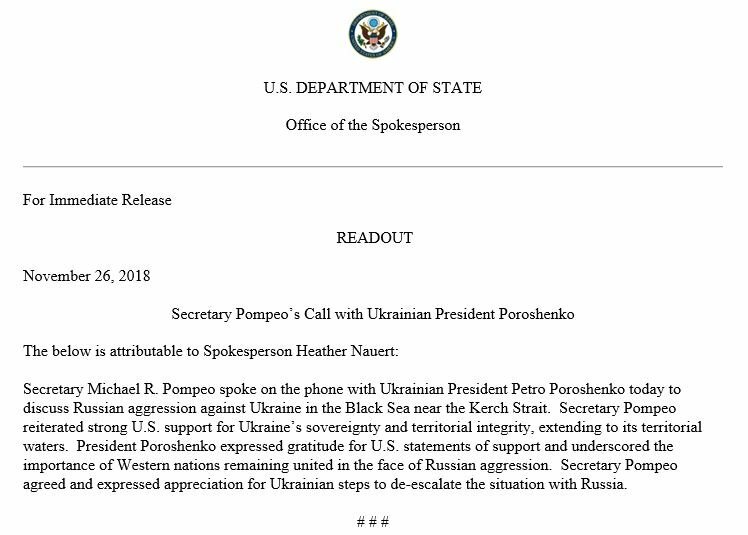 US Department of State: [email protected] spoke with Ukrainian President @poroshenko today to discuss Russian aggression against Ukraine near the Kerch Strait. 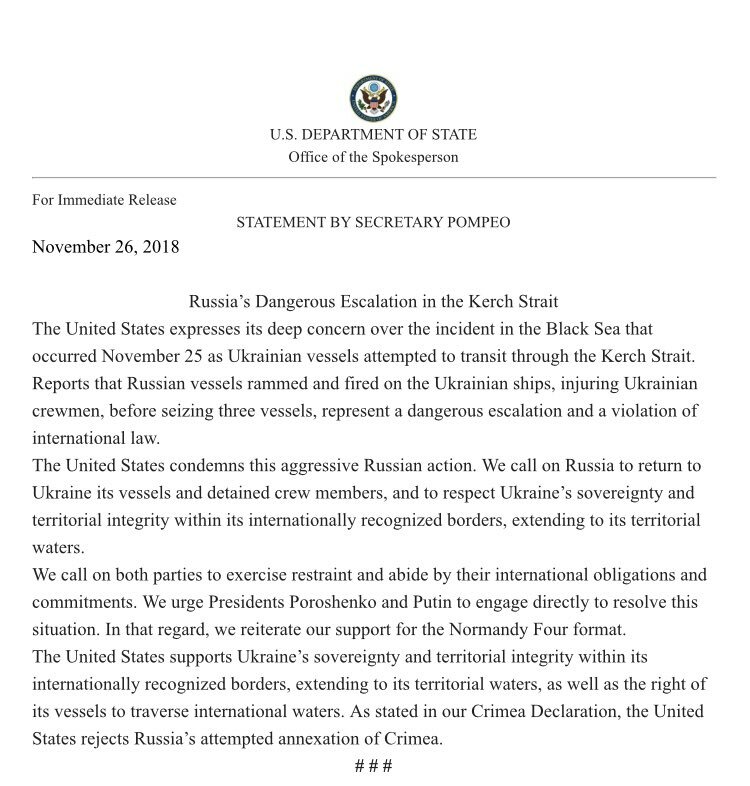 Secretary Pompeo reiterated strong US support for Ukraine's sovereignty and territorial integrity, extending to its territorial waters. In statement @SecPompeo calls on "both parties to exercise restraint and abide by their international obligations and commitments." 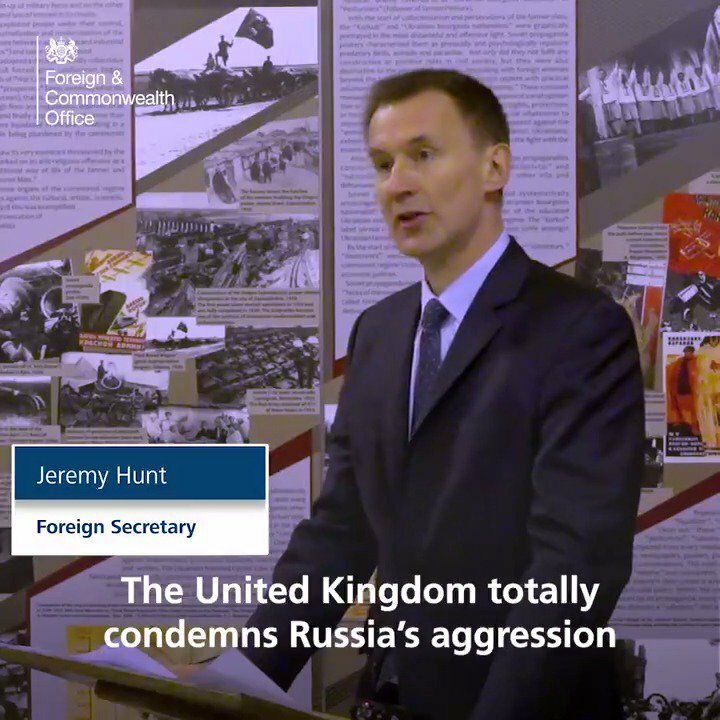 [email protected] on Russian aggression against Ukraine: "I know Europe isn't thrilled." 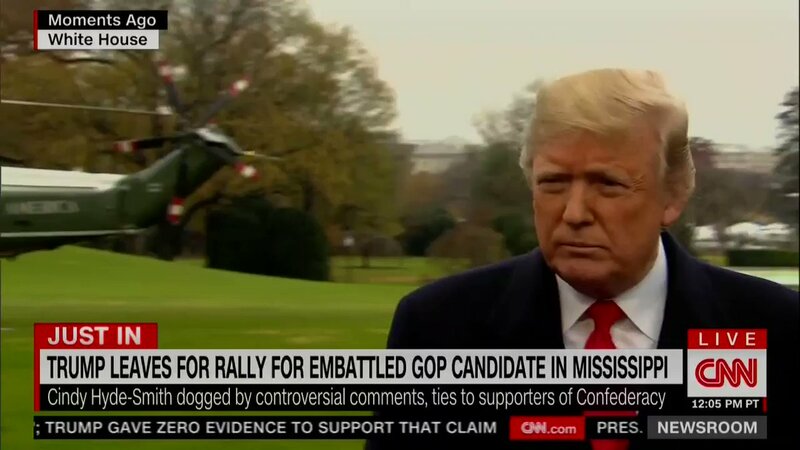 Trump frames Russia's aggression in Ukraine as a bothsides issue: "We don't like what's happening either way. We don't like what's happening." 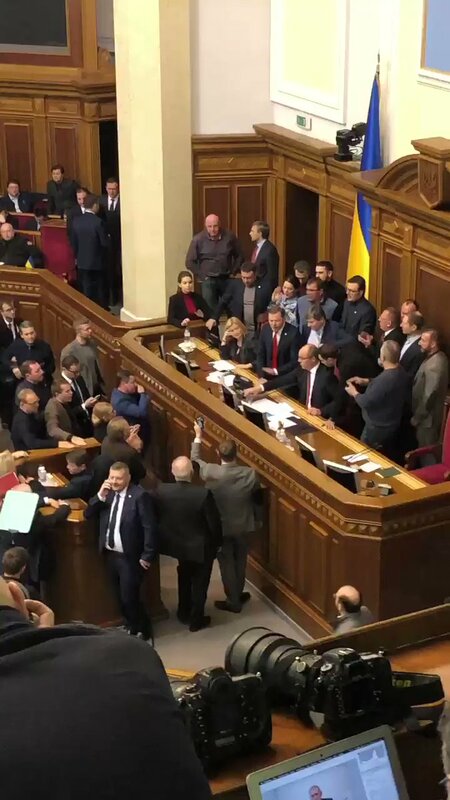 After a lengthy break for negotiations, Ukraine's parliament is back in extraordinary session. 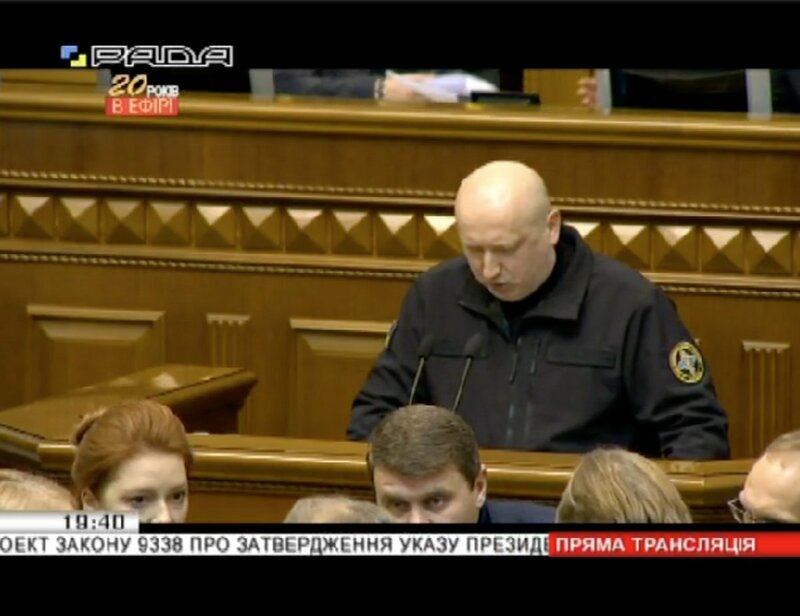 National Security and Defense Council Secretary Turchynov is addressing the hall now. Meanwhile, MPs continue to haggle with each other over martial law details and vote. 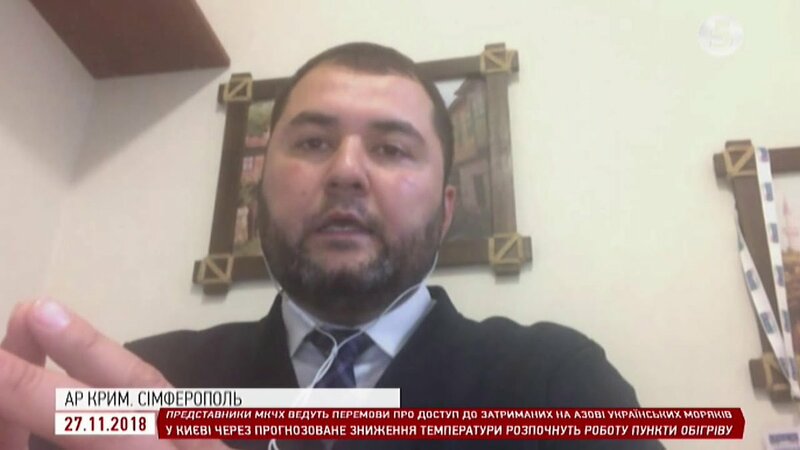 The Russian Foreign Ministry has summoned Ukraine's acting Charge d'Affaires Ruslan Nimchynsky and handed him a note of protest over the incident in the Black Sea off the coast of Crimea. 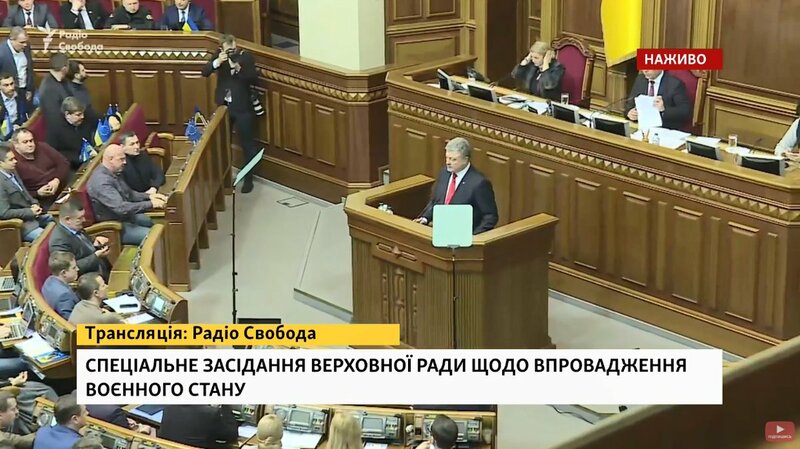 Poroshenko: I will ask Parliament to introduce martial law for 30 days, although @NSDC_ua recommended 60 days. It will be over in the mid-December. 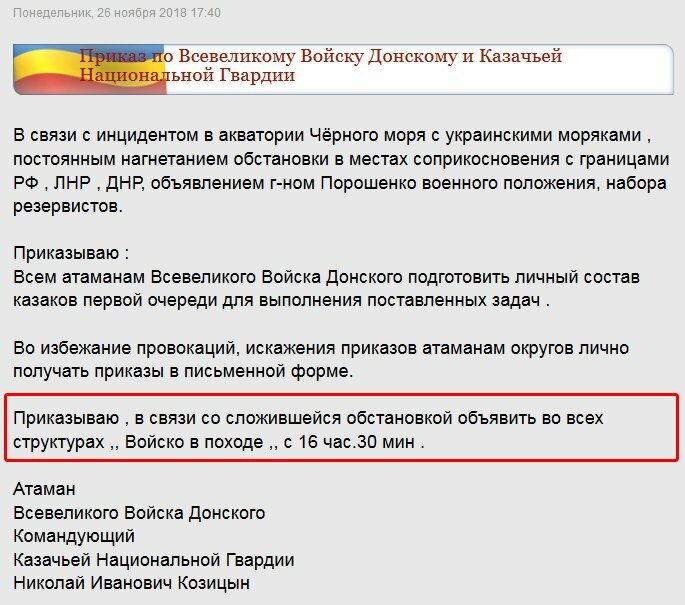 It will not influence the elections. Elections will take place on March, 31 as it is foreseen in the Constitution. 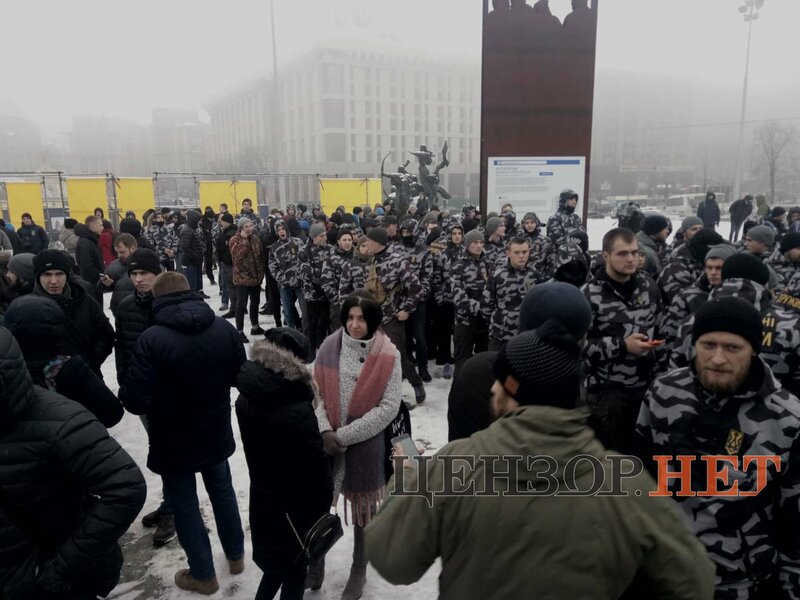 Poroshenko: there will be no mobilization. No restriction of the freedoms, no censorship. 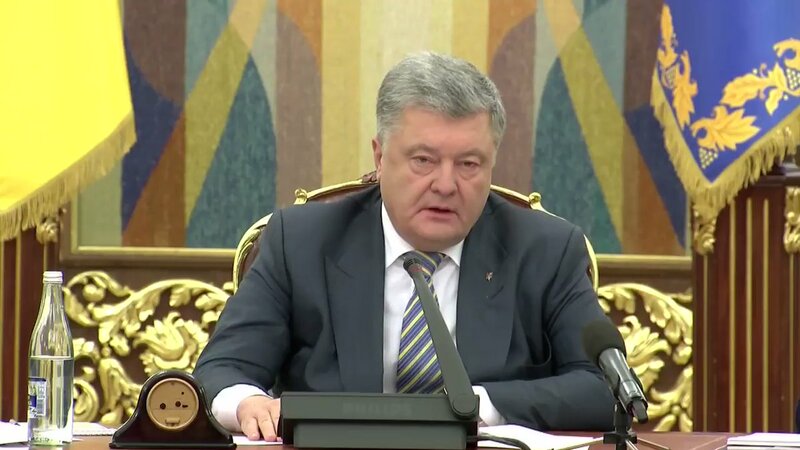 we will continue to follow our international obligations, Minsk agreement included. 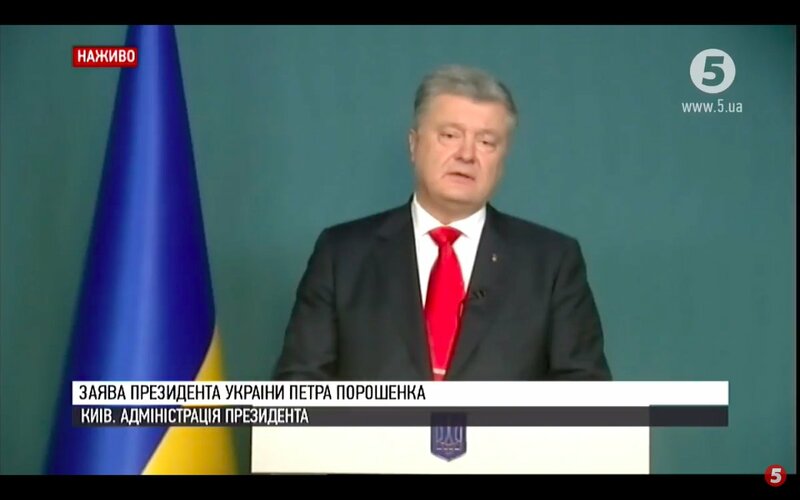 Poroshenko live now: we have serious grounds to believe Russia is ready to follow with the ground attack. I have evidence collected by our intelligence. 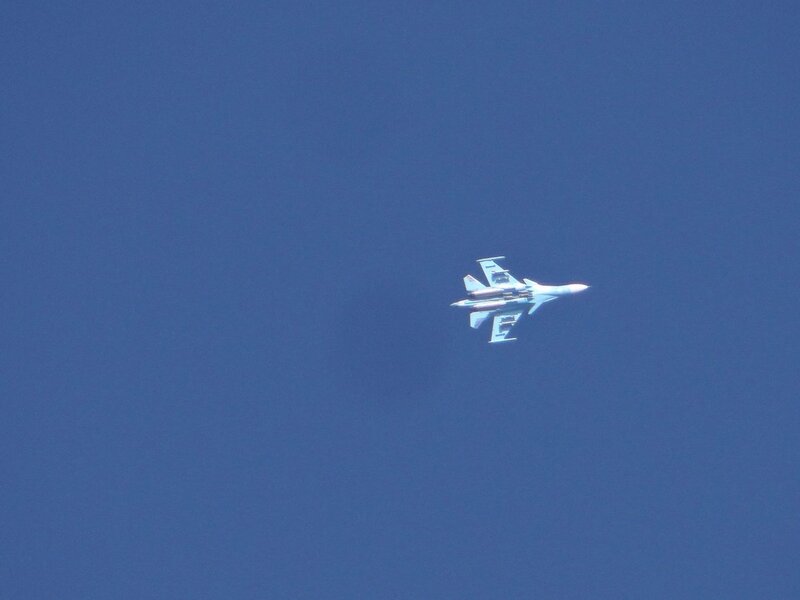 This time Russia is not hiding, blatantly attacking Ukraine. 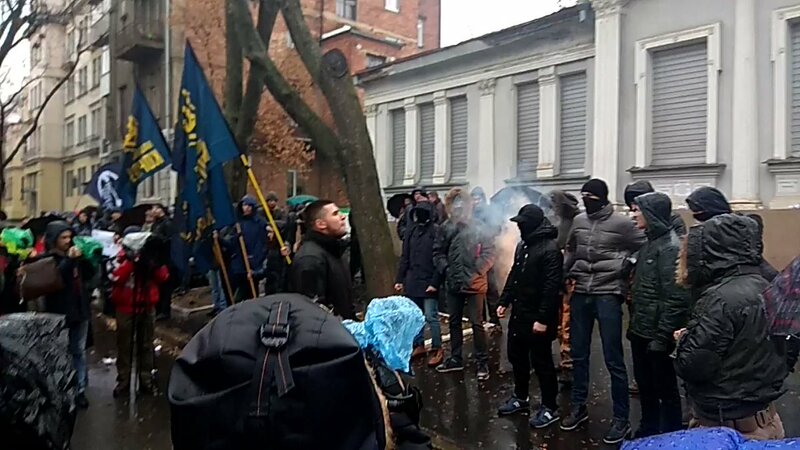 Parubiy: I fully support the decision of @NSDC_ua to introduce martial law. 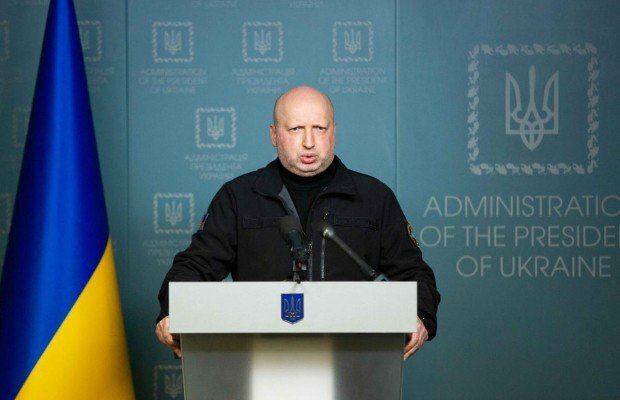 Yesterday's attacks were acts of aggression against Ukraine. 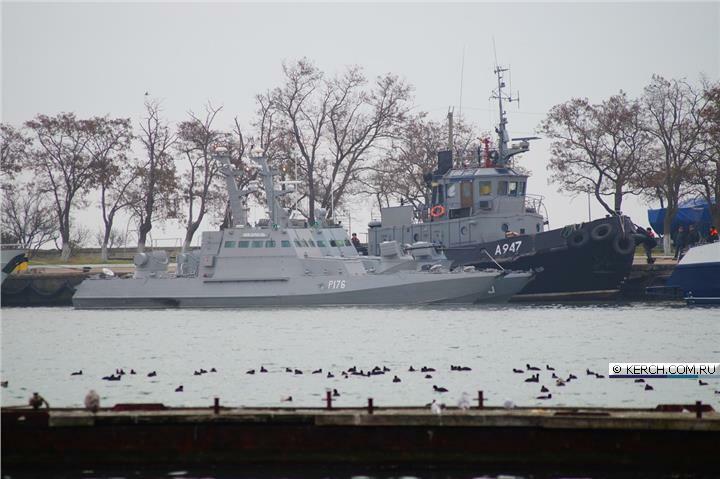 The @OSCE Chairperson's Special Representative to the TCG Sajdik and Chief Monitor of @OSCE_SMM Apakan called for restraint following incidents at sea. "It is time to address differences through political and diplomatic means," they said. 338 MPs have registered. 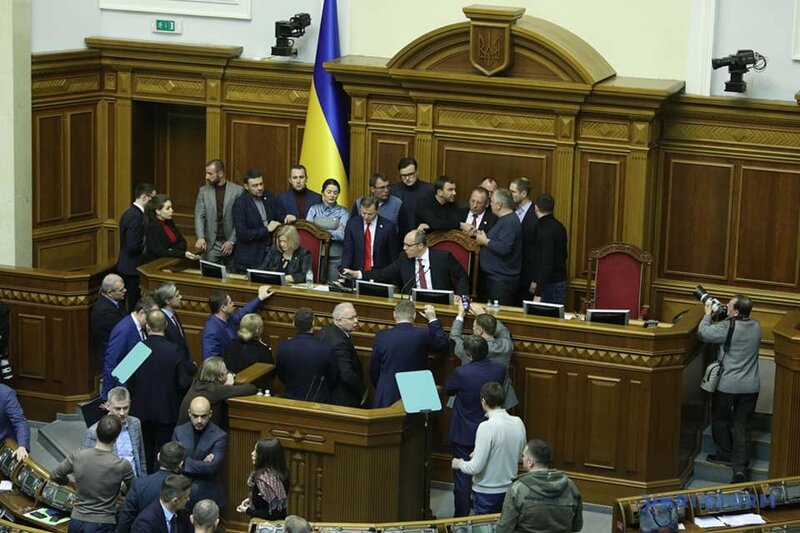 The extraordinary session of the Rada has began. 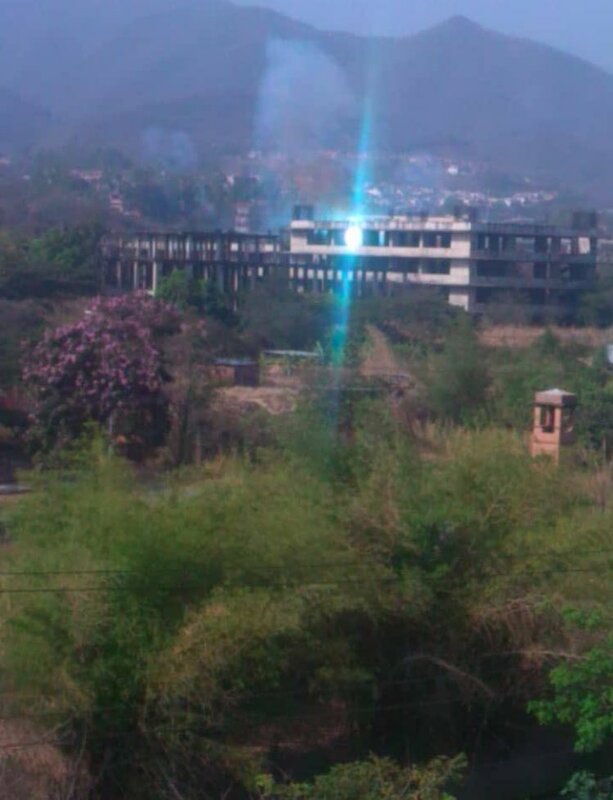 Police has attempted to move "owners of cars with foreign registration" from the highway to Yahodyn border checkpoint. 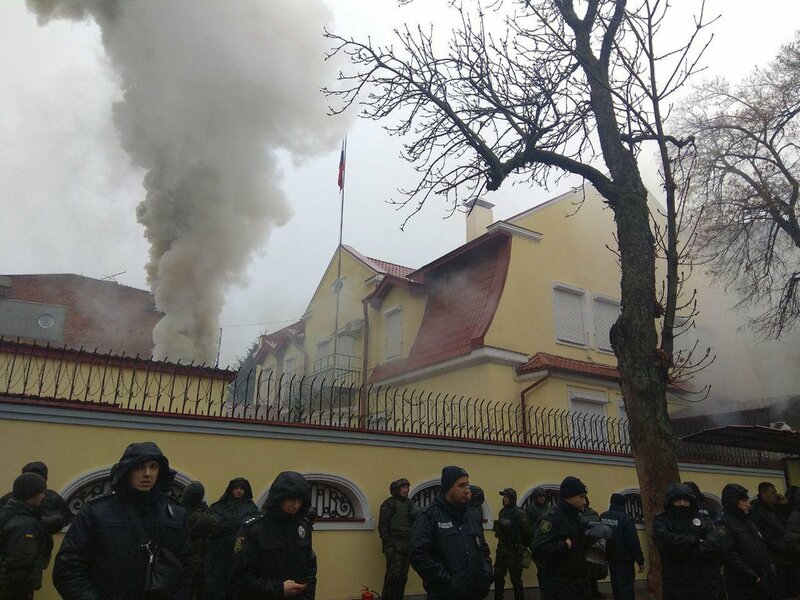 Lavrov on the threat of new sanctions after Kerch: "We stopped worrying about that a long time ago." Germany Foreign Minister @HeikoMaas on #Ukraine: The developments are worrying. 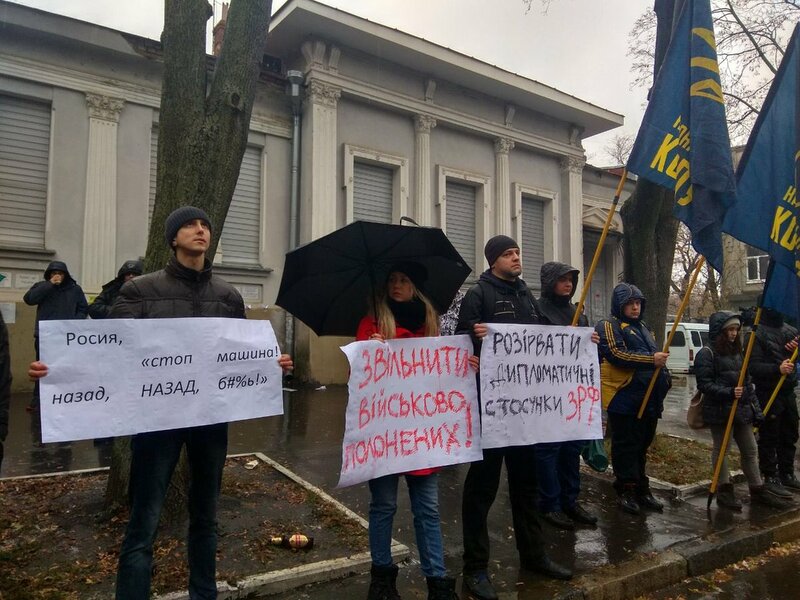 A Russian blockade of the passage into the Sea of Azov is not acceptable. Important that this blockade is lifted. We call on both sides to de-escalate. 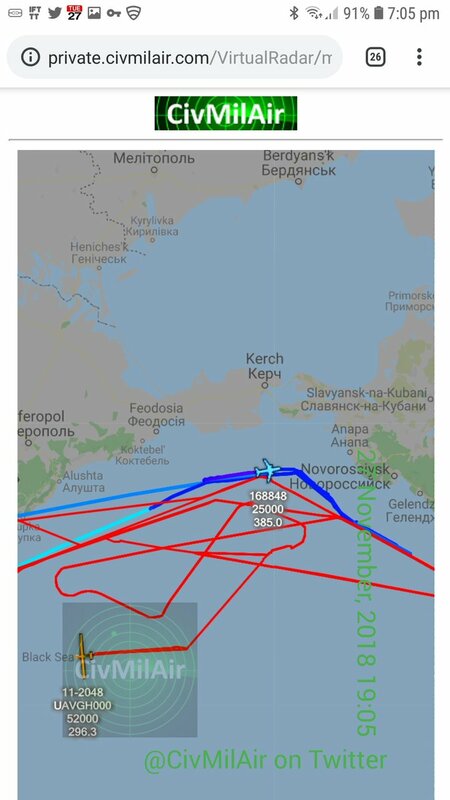 USAF RC-135V 64-14841 JONAS21 operating over the Black Sea. 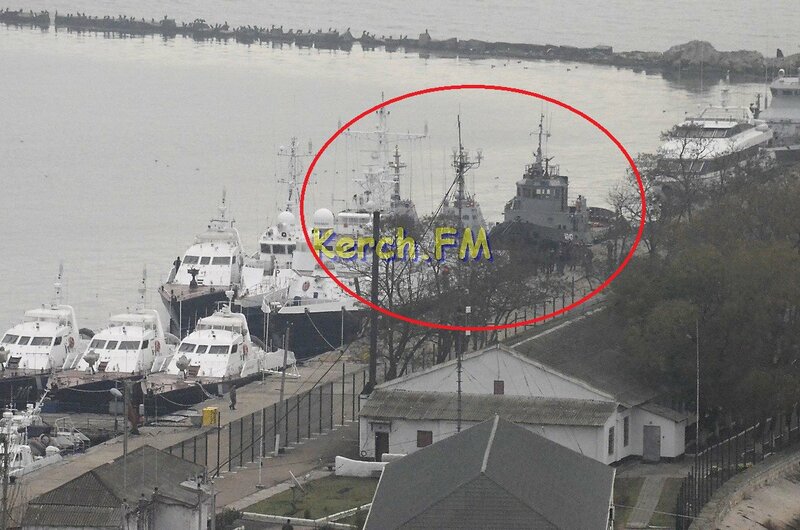 Russian service men in Kerch are camouflaging the captured Ukrainian gunboat Nikopol. 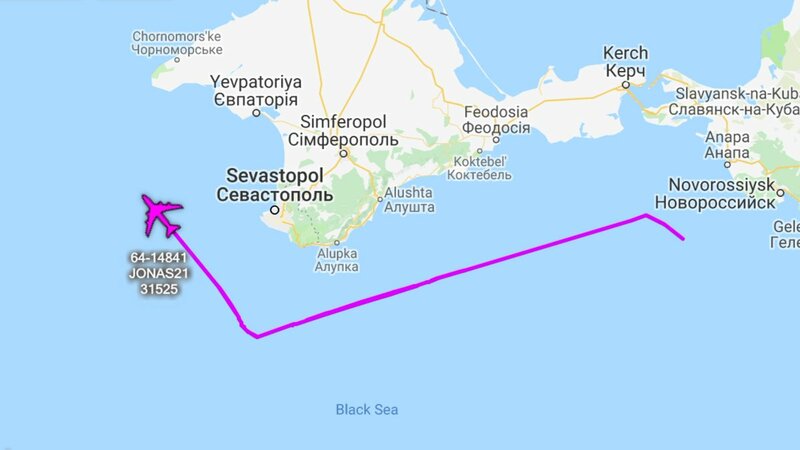 Sweden MFA: Deeply concerning escalation by Russia in Kerch Strait. 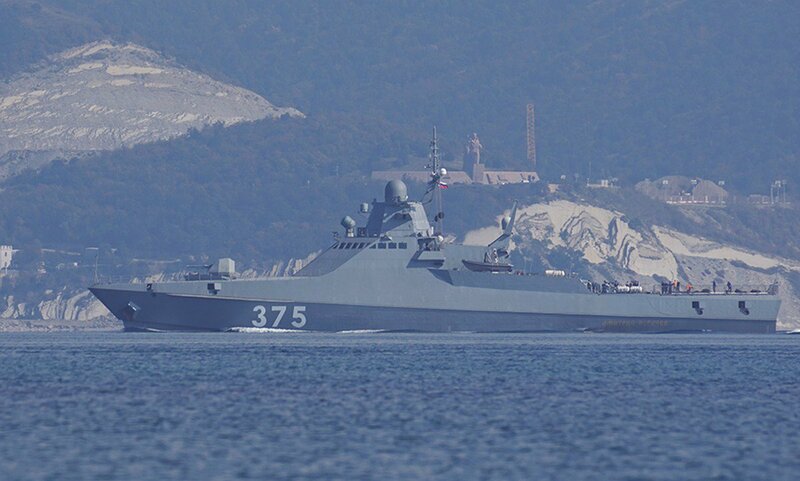 Russia must stop its provocative behaviour and allow for maritime transport in accordance with international law. Welcome discussion in UNSC on how to avoid further escalation. Dalia Grybauskaitė: Strongly condemn Russian aggression against Ukraine. 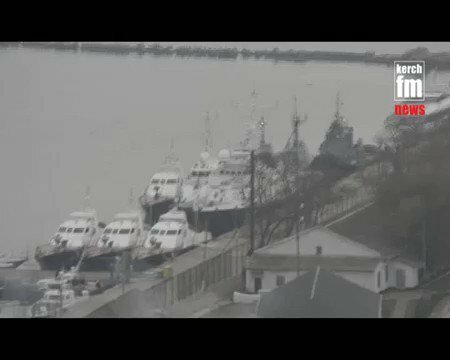 Capture of Ukrainian vessels in #KerchStrait - another blatant violation of international law and Russia's own commitments. 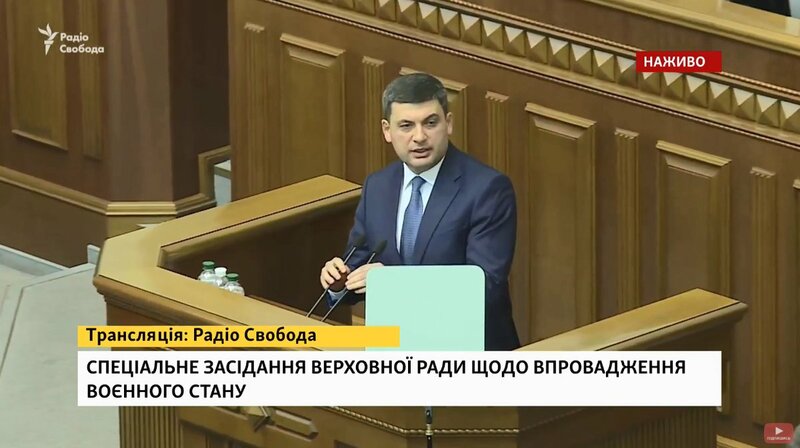 Canada condemns Russian aggression towards Ukraine in the Kerch Strait. 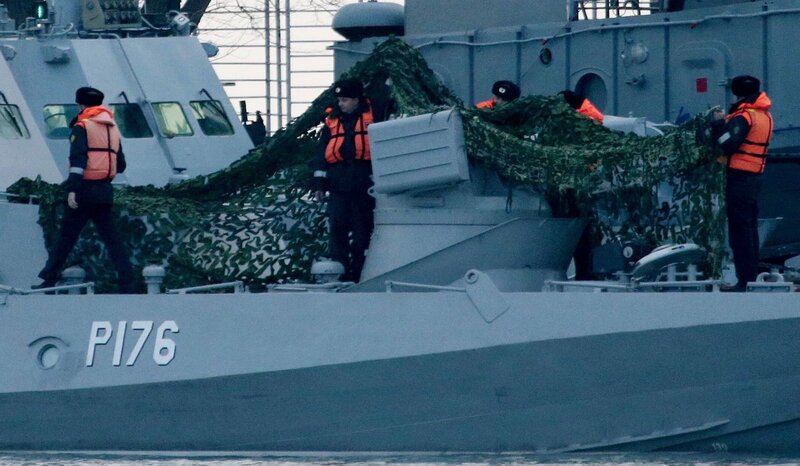 Call on Russia to immediately de-escalate, release the captured vessels, and allow for freedom of passage. Canada is unwavering in its support for Ukraine's sovereignty.